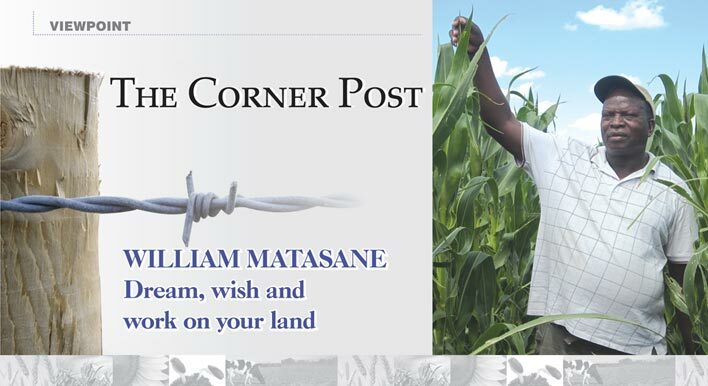 The 2010 Grain SA/Absa Developing Grain Producer of the Year, William Matasane, has proven that where your focus lies, is where your opportunities will arise. As a school boy he often visited his grandfather, who was a farm worker, during school holidays. Here he became intrigued with the food chain that begins in the ground on a farm. The idea of providing food for the people of the country made him dream of becoming a farmer. He started off his working career in the food industry as a waiter and worked his way up to assistant manager of the restaurant at the Allemanskraal Dam Holiday Resort. With a grant from the DRDLR and a loan from the Land Bank, he purchased his first farm, Verblyden. He has since paid off this loan and acquired two adjacent farms. Here he produces maize, sunflower and soybeans and also owns sheep and cattle. His wife, Alina is his right hand on the farm and handles the administrative side of the farming enterprise. William is a proud member of Grain SA and admits he was lacking in knowledge and skills before becoming involved with the organisation. Thanks to the excellent Farmer Development Programme and knowledge gained by attending study groups and farmers days, his knowledge concerning maize and sunflower production, resource planning and farm management has increased tremendously. He would however still like to learn more about Safex and grain trading to manage the marketing of his crop. The award he received in 2010 proved to him that his hard work did not go unnoticed. ‘Grain SA does not just give awards away. They evaluate carefully to see who deserves it,’ he mentions. This father of four has since then also become a member of the 1 500 Ton Club of Grain SA. Like so many farmers, William also has a tough season behind him with the severe drought, but still managed to harvest 1,4 t/ha on maize and 1,7 t/ha on sunflowers. ‘It is difficult to make money with the current maize price, as input costs are rising. My grey hairs all come from crop farming,’ he says with a smile. ‘Climate makes farming difficult as it is only the Higher Hand that can make clouds that bring rain – there is nothing a farmer can do and this keeps me humble.’ The yield on his first sunflower crop was 0,2 t/ha, while he achieved 1,2 t/ha on his first maize crop. In 2010 he harvested 1,5 t/ha - 2,5 t/ha on sunflower and close to 5 t/ha on maize, an achievement not many farmers in the Senekal area manage. Because of the decreasing profit margins in grain production, William has increased his cattle component and would like to expand the livestock side of his business with chickens, pigs and a dairy component. He currently runs a commercial beef cattle herd of 200 and is grateful that a stream runs though the farm as this ensured water and grazing for the cattle during the drought. Stock theft amongst sheep is a problem in this area, so he keeps his flock small. He remembers advice his grandfather shared: You should purchase one head of cattle for every hectare of land you cultivate. When problems arise, you can sell cattle to avoid losing your farm. This advice has proved helpful during the drought. For the future this humble farmer hopes that government will become involved in agriculture by working with farmers to ensure food security. He would like to help create more jobs and establish food security, but meaningful assistance like subsidies from government would make this easier. He would also like to see an agricultural representative at Safex who can see to the interests of the farmers. He feels strongly that politics has no place in agriculture. ‘Politics is for the man in the office, sitting in the shade. It has no place in the ground – the ground is for food security,’ he says. Farming is not a get rich quick scheme. It takes hard work, long hours and dedication before you will make a little money. Focus on increasing your knowledge – ask questions. Be a farmer – live on the farm, dream on the farm, get your hands dirty and do the work.